Good afternoon. I’m Allen Muchnick, a board member of both the Virginia Bicycling Federation and Active Prince William. Active Prince William was founded one year ago to advance bicycling, walking, and public transportation in Prince William County and greater Manassas. For the past eight years, the Virginia Bicycling Federation has sought to improve justice for bicyclists injured by negligent motorists. As a result, the General Assembly has modified Virginia’s traffic laws to finally prohibit motorists from following or passing a bicyclist too closely and from carelessly opening the driver’s door of a parked vehicle into the path of approaching traffic. While we appreciate these long-needed changes, more must be done to hold careless and distracted motorists accountable for their negligence. Last year, Senator Surovell and Delegate Sullivan each introduced bills to charge a careless or distracted motorist with a Class 1 misdemeanor and to suspend their driver’s license for one to three years if their negligence is “the proximate cause of serious physical injury to a vulnerable road user.” Although both bills died in committee last year, we are pleased that both legislators will file similar bills this year. Delegate Sullivan’s new bill is HB 1633. We ask the entire Prince William County delegation to endorse both bills as co-patrons. Distracted driving due to handheld electronic devices has been a growing cause of traffic crashes, injuries, and deaths for well over a decade. We strongly support Senator Surovell’s SB 860, which would generally prohibit the manual operation of a handheld personal communications device while driving a motor vehicle and would establish a reckless driving charge if a violation of this new prohibition is concurrent with an additional traffic offense or if the violation results in a crash. We ask the Prince William County delegation to strongly support this bill as well. Senator Surovell has also prefiled a bill to establish a reckless driving charge for motorists who pass, or attempt to pass, another vehicle by driving in a bicycle lane. We fully support that bill and would also support a reckless driving charge when a motorist passes another same-direction-motorist who is stopped at a marked crosswalk for pedestrian or bicycle traffic. In 2015 and 2016, bills were filed to not reduce highway maintenance payments to municipalities that have implemented road diets, whereby the space occupied by one or more conventional travel lanes is reallocated to create one or more bike lanes. Road diets are widely used, including in Northern Virginia, to effectively retrofit bike lanes while simultaneously improving a road’s capacity and safety for motorists; they should not be discouraged with counterproductive disincentives. We expect Delegate Villanueva to carry the road diet bill this year, and we ask you to endorse it as co-patrons. 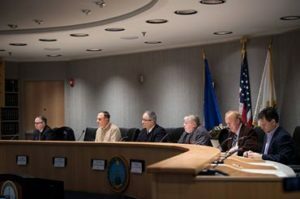 Cities, including Manassas and Manassas Park, would benefit significantly from this legislation. Thank you for considering my requests, and best wishes for a productive legislative session.